Turkish President Recep Tayyip Erdogan is set to meet with his Russian counterpart Vladimir Putin as the two countries are expected to fix positions over regional issues. The meeting scheduled for September 28, right after Turkish leader’s meeting with U.S. President Donald Trump, piques international community’s interest. "On Monday, we will have a telephone conversation with Mr. Putin, and we will have dinner together next Thursday in Ankara," Erdogan said at a business forum in New York, Anadolu reported. The agenda of the upcoming meeting is expected to include situation in Syria, as well as Turkey's purchase of S-400 anti-aircraft missile systems from Russia. 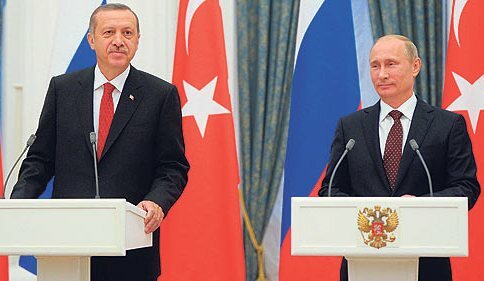 Reportedly, the two leaders will consider a plan agreed by Russia, Turkey and Iran to reduce the fighting in Syria’s northwestern Idlib province which was chosen as a de-escalation zone. Russia, Turkey and Iran - had agreed on May 4 in the Kazakh capital, Astana, to establish "de-escalation zones" in war-torn Syria. The zones would cover the city of Idlib and certain parts of Latakia, Homs, Aleppo and Hama as well as Damascus, Eastern Ghouta, Daraa and Quneitra. Syria has been locked in civil war since March 2011. According to UN's special envoy for Syria, Staffan de Mistura, around 400,000 people have died in the conflict while half the population has been driven from their homes. Russian presidential press secretary Dmitry Peskov, commenting on the upcoming meeting between Putin and Erdogan, said that the meeting is being worked out and the details will be disclosed later. Turkish Foreign Minister Mevlut Cavusoglu , in turn, noted the importance of the forthcoming meeting. "It is good when the leaders meet as they have the opportunity to discuss bilateral issues, the international agenda," he said. The last time the heads of the two countries met in July at the G20 summit in Germany. They discussed the conflict in Syria and the Akkuyu project. Erdogan previously said that his country, a NATO member, is “achieving a result’’ by working with Russia in Syria. Turkey together with the U.S. backs the rebel side in the Syrian war while Russia supports Bashar al-Assad’s regime. However, Ankara has increasingly been co-operating with Russia and Iran to stabilize the country. Moreover, Turkey’s decision to buy a Russian missile-defense system posed a question on Turkey’s position in the Western alliance. The deal on S-400 raised eyebrows among Ankara’s fellow NATO members and caused concerns as they are supposed to only buy compatible weapons systems from other members. Turkey explains the move saying that the country has to ensure it security and no other country from the NATO alliance has agreed to provide it with necessary arms.